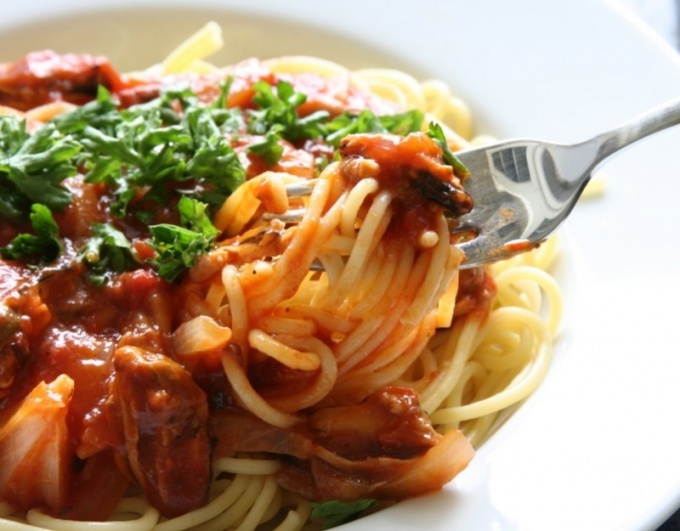 Connoisseurs of cooking pasta – the Italians have compiled a list of the most suitable of these pastry products. By combining them, you can every day to cook a new dish. Try to cook pasta with canned tuna. Onions and garlic peel and finely chop. Tomatoes wash, dry and cut into halves. Cut in half lengthwise pod of chili pepper, clean out seeds and rinse. Cut the flesh into very small. Drain oil from canned tuna, fish mash with a fork. Parsley wash, dry and chop. In large saucepan, pour water, add salt and boil. 400 grams of pasta you will need 4 liters of water. In the boiling liquid stir in the pasta and cook them on high heat to such a state that they were a bit harsh. So you will be able to retain their useful properties and real taste. In a pan heat olive oil and fry the onions and garlic until translucent. Remove the pan from the fire, add slice tomatoes, mashed tuna and chopped chilli. All the ingredients mix. Boiled spaghetti, drain and mix with chopped parsley and fish-vegetable mixture. Sprinkle the dish with ground black pepper, stir and lay on portions plates. Italian foods list is best combined with pasta include: tomatoes, onions, zucchini, eggplant, cauliflower, peppers, garlic, mushrooms, Basil, lemon, cream, cheese, eggs and marine invertebrates. Choosing to store pasta, read the package. On the pack of high-quality pasta should be the inscription: "durum wheat" or "group a, 1 class". Such products are useful for the organism, because they are a source of vitamins and minerals (calcium, potassium, iron, magnesium and phosphorus). In addition, they contain fewer calories than flour made from soft wheat. In Italy, Greece and France even have laws that prohibit the use of a flour for pasta production.